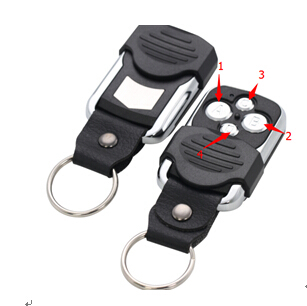 3rd Generation Rolling code is 280Mhz-450Mhz Multi Frequency face to face copy remote control. 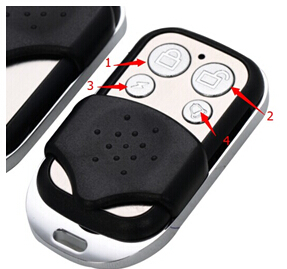 Rolling code Self-Copying Car Door Remote control can copy Rolling code with fixed frequency. Auto Diagnostic OBD Factory provides lots of 3rd Generation remote controls. 1.The following frequency for choice (fixed Code): 303MHz, 310MHz, 315MHz, 330MHz, 350MHz, 370MHz, 390MHz, 418MHz, 430MHz,433.92MHz..., Rolling code: 280Mhz-450Mhz. Rolling code: HCS101, HCS200201(some pars of code), HCS300301(some pars of code) and some part of single chip. 4. No need to consider the shock resistance, the product compatible shock resistance automatically. Press “1” button (closed button) and ”2” button (open button) simultaneously. 2seconds later the LED will flash 3times, then release “2” button and press it for 3times, then LED light will flash, release all the buttons. Press any buttons, the LED light is off, that mean code is clear successfully. If press any buttons, the light is on, then means the code haven’t clear well. Please try again. Take your original remote on left hand, and take our remote on right hand, please try to put two remote keys closed. Press two “Lock button”(“1”button) in the same time with your two hands. 2 seconds later the Led light will flash 2times---1 second later will flash 3times---1seconds later the light will be long on. It means our remote has copied well the code of “Lock button” from original remote. It is the same operation to copy the code of other 3buttons. 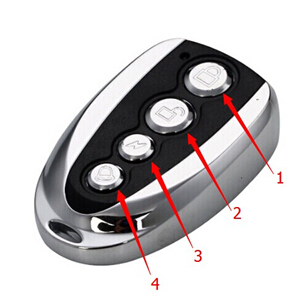 When you delete the code involuntary, you can press “3” and ”4” buttons at the same time, then LED light will flash quickly, then release all the buttons, and press any button, the light on, it means the code is recovery. please ensure to clear well the code of our remote before using it to copy other remote’s code. When you finish all the clear work, you can press any button, if the LED light is off, then the code is cleared well, if LED light is long on that means the clear work is failed.